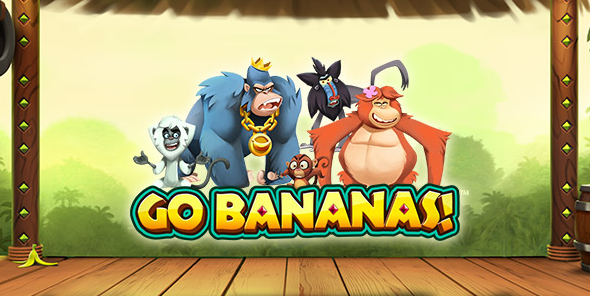 Go bananas is a five-reel and 10 pay line slot developed by Net Entertainment. Go bananas doesn’t feature a progressive jackpot but the 140,000 coin jackpot will still make you go bananas. But the Jackpot is not the only exciting feature in this game. When the game loads, you will be treated to incredible graphics and equally fantastic audio. Although the game appears simple, it doesn’t take long for the players to realize there’s more to the game than meets the eye. The game theme features monkeys – lots of monkeys. In fact, this is a monkey themed slot game. But Go bananas is not only about monkeys. Other symbols you will encounter when playing this slot includes tropical fruits, bank notes, ice cream sundaes and banana bunches. The different monkey symbols play wild. When you land the monkey symbols, they will immediately turn the neighboring symbols into wild which will increase a player’s chance of winning tremendously. If you are veteran slot player, you will concur with me that this is an unusual behavior for wilds, but I guess it is a way of adding fun and thrill into the game. Net Entertainment is famous for using thrilling features in all its games. Another extraordinary characteristic of Go Bananas is the shouting lack of scatter symbols. This however should not discourage you from playing this game since it is jam-packed with more features that make it unique and thrilling at the same time. Go Bananas players get to enjoy the Auto Play feature. In this feature, players have a chance to choose the number of spins they want to make at a particular bet size. This feature comes in handy when you want to play on a strict budget and when time is of the essence. The Auto Play feature spins the reels on behalf of the player. For every spin, the player gets a chance to see the symbols they land. If a winning combination is encountered, the reels continue spinning, and the counter is decreased by one. Well, the Go Bananas game doesn’t offer a wide array of bonus but its wild symbols are bonus enough. The wild symbols convert all other adjacent symbols turn into wilds increasing the winnings that players can scoop. The game also lacks free spins! Well, why should you put a bet on this game? To compensate for the lack of free spins, Go Bananas has wild multipliers. For Example, when you land five or more wild monkeys, you may get your initial bet multiplied up to 700x. That’s why it is advisable that you place the maximum bet. Go Bananas will not appeal to most high rollers but its bet range is flexible enough to accommodate budget players and high rollers alike. The bet size is between 0.01 and 1. This may sound a little bit small for high rollers, but if you consider the massive payouts that accompany the wilds, then it is worth playing.